Let’s face the reality here. The best made lower denture in the world is still not the most comfortable nor most functionally efficient appliance. Despite the fact that dentures are a great choice to replace missing teeth, their retention has always been an issue. To further exaggerate this problem, it is a known fact that an edentulous ridge resorbs a certain percentage per year, therefore causing the dentures to become more ill fitting and create major sore spots in the mouth. The solution to this problem: Dental Implants. 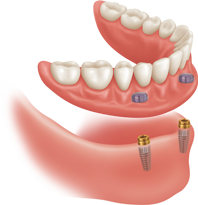 By placing dental implants on the lower jaw, we are able to lock in your lower denture. You’ll be able to enjoy meals at restaurants and gatherings with your friends without worrying about your denture popping out. On a second note, do you hate not being able to feel the roof of your mouth with that upper denture in? Do you want to be able to enjoy your foods again as you chew? In some cases, placing implants on the upper arch allows us to remove that denture acrylic on the palate giving you back your senses. You’ll be able to feel texture, temperature, and taste again. Should you consider dental implants to lock in your dentures? ……ABSOLUTELY! 1) What is the procedure of placing dental implants? Our advice to you is to click on the dental services section of our website, www.918dentist.com, then click on dental implants and watch the second short video to obtain the information you need. 2) Which dentist can perform the procedure? Of course we hope you choose us, and if the case needs the attention of an oral surgeon, we have one of the most reputable oral surgeons in Tulsa that we can refer you to. Most dentists, who provide this service, including us, have had extensive additional training in implants. 3) Do I need to be out for this surgery? Not really. In most cases minimal oral sedation and nitrous oxide is sufficient to make you comfortable enough to place the implants. If we find it absolutely necessary for you to be under IV sedation, we will refer you to our oral surgeon. 4) Does my insurance pay for dental implants? Most dental insurances consider dental implants standard of care and cover a portion of your dental implant procedure up to your maximum annual allowance. 5) How much do dental implants cost? Dental implants are a lot more affordable than what they used to be. We have checked the prices around Tulsa, and we believe we have very competitive prices. Please come and check us out. 6) What is my healing time? Usually the healing time depends on whether we have placed smaller implants or larger implants. And the actual healing time can vary from 3 weeks to 6 months. But you will not have any down time. Most of our patients are able to go to work the next day. In very limited cases, some may have needed to rest 3 to 4 days before they return to work. We are here for you 24/7 to support you in your healing process. You have nothing to worry about. Our team and our two doctors are available to answer your questions at any given time. Please feel free to contact us at 918-216-1000, ask us your question on our website, or shoot us an email at info@918dentist.com.